We nearly missed the lovely profile of astrophysicist Carolyn Porco that appeared last week in The New York Times. Porco trailblazed was part of the team that analyzed data from the Voyager spacecraft in the 1980s, making her one of the young up and coming “rock stars” of space science. 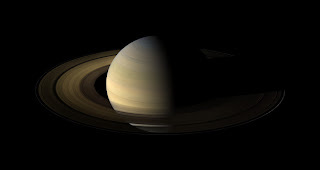 Mentored by Carl Sagan, among others, Porco now heads the camera team for the Cassini spacecraft, currently orbiting Saturn (as it has been for the last five years), which recently released some gorgeous new images of the ringed planet. Porco has a colorful background. The daughter of an Italian immigrant who drove a bread truck, she went to the State University of New York at Stony Brook and spent two years as a chanting Buddhist, complete with a pilgrimage to Japan to be a majorette in a Buddhist marching band. She moved on from Buddhism, but not from music: she played guitar and sang with fellow scientists and science writers in the Titan Equatorial Band. She caught her first glimpse of Saturn at age 13 through a neighbor’s rooftop telescope and went on to earn graduate degrees from Caltech, writing her thesis on how the gravitational effects from tiny moonlets helped shape Saturn’s rings. She “demonstrated a knack for picking out important things,” according to her thesis advisor, Peter Goldreich. Porco is also actively involved in science communication and outreach, both through the usual channels, and via Hollywood. She was a consultant on the film Contact, and more recently, for J.J. Abrams’ summer blockbuster, Star Trek. Remember when the Starship Enterprise materialized inside clouds around Titan? That was Porco’s contribution, and it made the cover of Cinefex, a publication devoted to special effects in the movies. “She helped us feel connected to what [series creator] Gene Roddenberry had been trying to do. This is our future,” Abrams told the Times. Her favorite movie, though, is Stanley Kubrick’s classic, 2001: A Space Odyssey.